Constituents: Rich in essential oil containing citral, citronellal, geraniol and lindol; bitter principles, flavones, resin. How does it work? Lemon balm contains chemicals that seem to have a sedative, calming effect. It might also reduce the growth of some viruses. A member of the mint family, lemon balm is considered a “calming” herb. It has been used for centuries to help heal wounds, treat venomous insect bites and stings, induce relaxation and a sense of well being, improve appetite and aid digestion. Lemon balm, known and named for its fresh, lemony scent, has long been used as a culinary, cosmetic and medicinal and magical herb. Note: Lemon Balm, though often called Bee Balm, should not be confused with another plant commonly called Bee Balm (Mondara dydima). The botanical name, melissa, is Greek for “bee”. 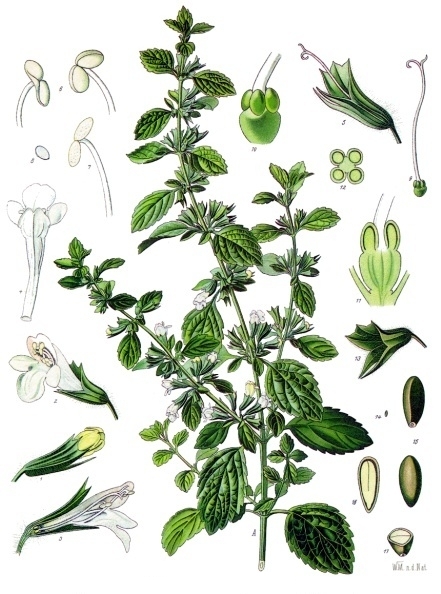 Lemon balm has been cultivated in the Mediterranean region for about 2000 years. The Muslim herbalist Avicenna recommended lemon balm “to make the heart merry”. Paracelsus claimed this herb could completely revitalize the body and called it the “elixir of life”, and 14th century French King Charles V drank its tea every day to keep his health. Lemon balm is excellent for treating anxiety and battling some hard-to-treat viruses. The list of symptoms from anxiety is vast but melissa tackles them all bravely. It is equally fearless when it comes to taking on viruses as daunting as Mono and Herpes. This is an herb every healer wants in the medicine cabinet. In Ayruvedic medicine, Lemon Balm’s energy is pungent, sour-sweet, cool, and wet. Crushed leaves rubbed on the skin in the garden helps keep away bugs. Lemon balm is inhaled as aromatherapy for Alzheimer’s disease. 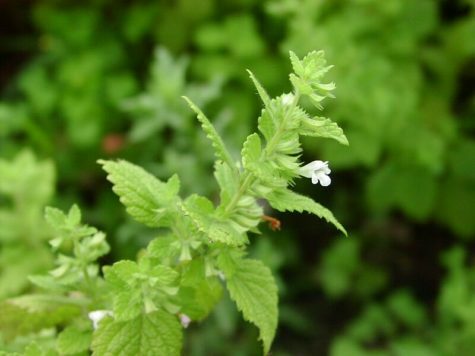 Some people apply lemon balm to their skin to treat cold sores (herpes labialis). A familiar garden plant with its fresh, green, nettle shaped leaves and strong bushy growth, lemon balm is native to southern Europe and was probably introduced to the north by the Romans. The creamy flowers are undistinguished and grow in loose clusters from midsummer. The hardy root is perennial. Lemon balm has the square stems indicative of the mint family with green, oval, finely toothed leaves that grow opposite each other on the stem. The leaves also have fine hairs that capture morning dew and helps keep the plant moist. Flowers are small and yellow to white depending on soil type. It can vary in height between 12 inches to well over 3 feet. Easy to grow and tolerant of most soils, it does especially well on a fairly rich, moist ground in a sheltered, sunny position. Sow seeds in the spring or late summer; divide the roots in the fall or early spring; take cuttings in the summer. Keep the plants well weeded. It prefers moist, not soggy, loamy soil in full sun but will develop more volatile oils when grown in drier, shadier soils. It can tolerate a vast pH range from 5 to 8 in the soil. Lemon balm flowers in the summer and provides an excellent source of nectar for bees and hummingbirds. Barely cover seed to germinate in 1-2 weeks at room temperature. Set out at 12-15 inches apart in full sun and rich soil. This perennial plant typically gets 12-18 inches tall. 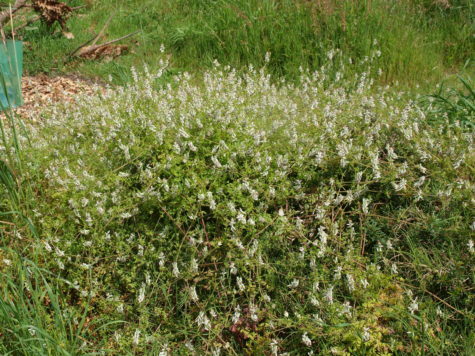 Like any mint, it can be aggressive–it spreads by runners, self-seeds, and can be propagated by cuttings. But it’s a plant, not a monster. I have my lemon balm in partial shade, next to my cabbages and some other aromatic herbs. It has formed some nice thick clumps in two years, but it is not taking over the garden by any means. If you feel concerned, plant it in a pot and sink the pot in the soil. It is hardy to zone 4: -30°F. It is a good companion plant for members of the brassica family, and deer don’t usually eat it. 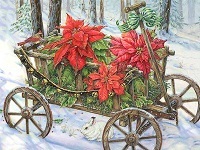 For drying, harvest leaves just before or after it flowers. Don’t harvest when it’s wet or the leaves will discolor. Leaves may be harvested two or three times a year between early summer and early fall. They are gathered by cutting off the young shoots when they are approximately 12 in long. Harvest them for drying as the flowers begin to open. Dry quickly and carefully in the dark, or in the shade, to preserve their color. 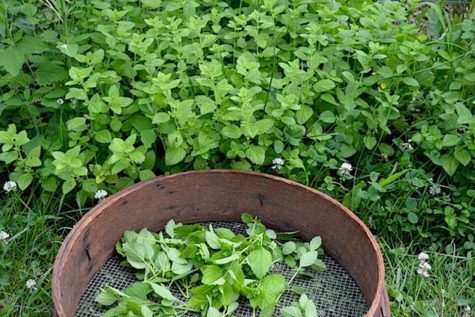 They should be dried at a temperature not above 95° F.
Unlike other herbs which are at their best when the dew has dried off them in the morning, Lemon Balm should be harvested in mid to late afternoon when the oils are strongest. Lemon balm can be harvested for fresh use once or twice a week and leaves can be kept in the fridge for a few days, or be frozen. Leaves should be handled delicately as they tend to bruise and turn black. Hang sprigs to dry in dark cool place. Be sure to keep out of moisture, as leaves are prone to browning and more susceptible to mold. Store dried leaves in air tight container. The leaves lose some of their flavor when dried. Lemon balm is an excellent carminative herb that relieves spasms in the digestive tract and is used in flatulent dyspepsia. Because of its anti depressive properties, it is primarily indicated where there is dyspepsia associated with anxiety or depression, as the gently sedative oils relieve tension and stress reactions, thus acting to lighten depression. Constituents: 30% mucilage, bitter principle, volatile and fixed oil, flavonoids, alkaloids, coumarins, vitamins, and saponins; the most prevalent alkaloid is trigonelline and coumarins include cinnamic acid and scopoletin. Originally from the eastern Mediterranean, cultivated in Europe, Africa and Asia for thousands of years as a fodder plant, a medicine, and a spice, Fenugreek is an herb that has an ancient history. It has great use in local healing and reducing inflammation for conditions such as wounds, boils, sores, fistulas, and tumors. It can be taken to help bronchitis and gargled to ease sore throats. It’s bitterness explains its role in soothing disturbed digestion. The seeds are rich in vitamins, nitrates and calcium, have a softening soothing action and are said to encourage lactation. It is a strong stimulator of milk production in nursing mothers, for which it is perfectly safe, and also has a reputation for stimulating development of the breasts. In traditional medicine, Fenugreek is thought to promote digestion, induce labour, and reduce blood sugar levels in diabetics. It is an annual and grows about 2 ft high with yellowish peaflowers in midsummer, trifoliate leaves and long narrow pods containing at least 10 square seeds, reaching maturity in a few months in warm climates. It is tender in temperate climates. It is an annual, erect, robust aromatic herb which grows up to a height of 60 cm. it has compound leaves around 5 cm in length, with long pedicles. The leaflets are obovate, around 2.5 cm long and the margins are slightly toothed. Flowers are seen in pairs or single, axillary and yellow in color. Fruits of the plant are leguminous pods around 5-8 cm long, with a persistent beak, narrow and enclose 10-20 golden yellow seeds which have a typical savory aroma. 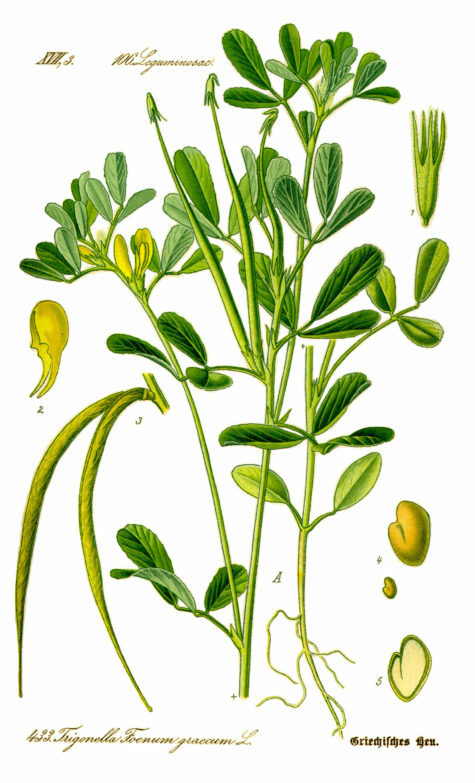 Fenugreek is a fairly fragile annual that has a visual similarity to clover. Preferring rich soils and requiring full sun, it grows from one to two feet in height and blooms in smallish white flowers during midsummer. The primary caution in planting Fenugreek is an awareness of soil temperature. It must have a soil temperature of at least 55°F to germinate, in colder or very damp soils the seeds will rot, and the plant itself will be prone to root rot even when older. Fenugreek is a herb which is bitter to taste and increases lactation, soothes tissues which are irritated, stimulates uterus, reduces fever, blood sugar, improves digestion, improves relieving capacity and works as an expectorant, diuretic, laxative, anti-tumour and anti-parasitic effects. Fenugreek relieves diabetes, poor digestion, tuberculosis, gastric inflammation and digestive disorders. Cholesterol: It is a proven fact that by consuming Fenugreek cholesterol can be balanced. Around 2 ounces can be taken every day. Diabetes: Fenugreek is effective in relieving Type 2 diabetes. Consumption of around 500 mg Fenugreek every day will yield the desired results. Skin inflammation: Fenugreek is very effective in relieving burns, boils, abscesses, gout and eczema. Fenugreek powder should be made into a paste with water and a cloth should be soaked into this paste. The soaked cloth can be applied on the affected area of the skin as a poultice. Heartburn and Acid Reflux: Seeds of Fenugreek contain mucilage which help is soothing gastrointestinal inflammation. It coats the lining of the intestine and stomach. Hence it works effectively against acid reflux and heartburn. Around 1 teaspoon Fenugreek seeds can be swallowed along with water before meal. Fever: This herb is useful for reducing fever. The seeds should be consumed along with honey and lemon. Breast enlargement: Fenugreek balances female hormones. It should be consumed up to 3g every day. 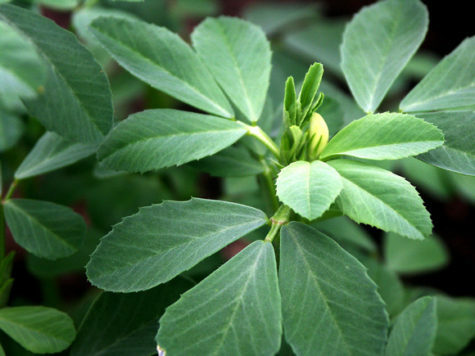 Child Birth problems: Fenugreek stimulates uterine contractions and is helpful in inducing childbirth. But pregnant women should use this remedy only after consulting the doctor. Lactation: Fenugreek influences milk production in nursing mothers. Constituents: Alkaloids, bitter principle, mucilage, fumaric acid, amino acids, resin. The plant contains isoquinoline alkaloids protopine and allocryptopine. Earth smoke, as it is also called, is a wild poppy plant traditionally used as an incense herb with a stimulating effect on liver and gallbladder and as a protection against skin diseases and eczema. The drug fumitory is toxic in high doses. 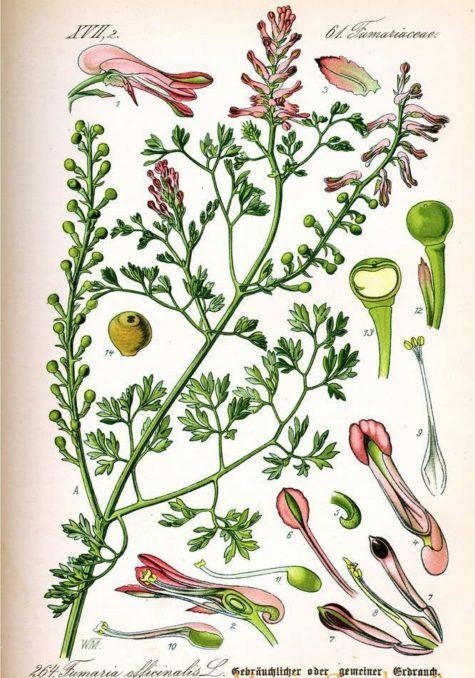 Fumitory has been known since antiquity and was described in herbals from the Middle Ages. 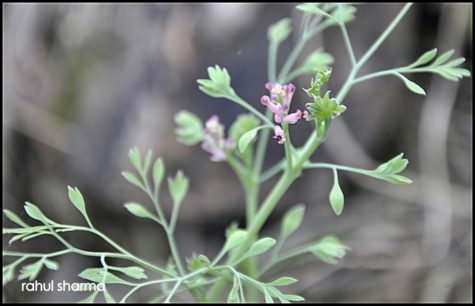 Fumitory is a predominantly Mediterranean genus that once was used medicinally. Traditional preparation involved expressing the juice and evaporating it. It has been used as a laxative and diuretic. Fumaria species are used in Turkish folk medicine as a blood purifier and an anti-allergic agent. In traditional medicine, the plant has been used to treat eczema and other dermatologic conditions. It was thought to be good for the eyes, and to remove skin blemishes. In modern times herbalists use it to treat skin diseases, and conjunctivitis; as well as to cleanse the kidneys. Fumitory has a long history of use in the treatment of skin problems such as eczema and acne. Its action is probably due to a general cleansing mediated via the kidneys and liver. Fumitory may also be used as an eyewash to ease conjunctivitis. The name is said to be derived either from the fact that its whitish, blue-green colour gives it the appearance of smoke rising from the ground, or, according to Pliny, because the juice of the plant brings on such a flow of tears that the sight becomes dim as with smoke, and hence its reputed use in affections of the eye. The leaves yield by expression a juice which has medicinal properties. An extract, prepared by evaporating the expressed juice, or a decoction of the leaves, throws out upon its surface a copious saline efflorescence. Fumaric acid was early identified as present, and its isomerism with maleic acid was established later. The alkaloid Fumarine has been believed to be identical with corydaline, but it differs both in formula and in its reaction to sulphuric and nitric acids. It occurs in colourless, tasteless crystals, freely soluble in chloroform, less so in benzine, still less so in alcohol and ether, sparingly soluble in water. The “smoky” or “fumy” origin of its name comes from the translucent color of its flowers, giving them the appearance of smoke or of hanging in smoke, and the slightly gray-blue haze color of its foliage, also resembling smoke coming from the ground, especially after morning dew. Parts Used: Leaves, flowers, root. Medicinal Actions: Demulcent, expectorant, tonic, antitussive, anticatarrhal, diuretic, emollient, pectoral. 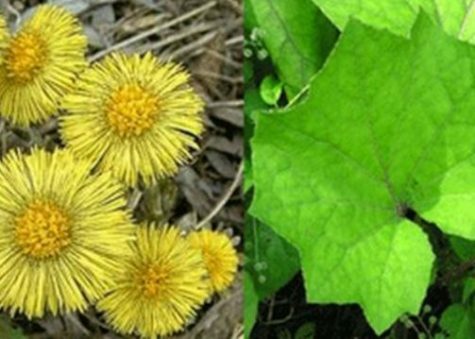 Coltsfoot root contains tumorigenic pyrrolizidine alkaloids and it suspected that there may be small quantities in the leaves. There are documented cases of coltsfoot tea causing severe liver problems in an infant, and in another case, an infant developed liver disease and died because the mother drank tea containing coltsfoot during her pregnancy. In response the German government banned the sale of coltsfoot. Clonal plants of colstfoot free of pyrrolizidine alkaloids were then developed in Austria and Germany. This has resulted in the development of the registered variety Tussilago farfara ‘Wien’ which has no detectable levels of these alkaloids. The coltsfoot is another wonderful remedy for coughs and colds, whooping cough and shortness of breath. It has a little yellow flower that smells of honey and blooms in February, long before the leaves which grow to enormous size. Coltsfoot grows nearly everywhere, on rubble heaps, by the side of newly-made roads, on railway banks and on coal mine tips. In fact there is a very old gypsy saying that wherever coltsfoot grows freely, coal will be found. Once it was so revered in France that coltsfoot flowers were painted as a sign on the doorpost of apothecarie’s shops to let people know that the art of healing was practiced there. Coltsfoot combines a soothing expectorant effect with an antispasmodic action. There are useful levels of zinc in the leaves. This mineral has been shown to have marked anti-inflammatory effects. Coltsfoot may be used in chronic or acute bronchitis, irritating coughs, whooping coughs and asthma. Its soothing expectorant action gives coltsfoot a role in most respiratory conditions, including the chronic state of emphysema. The Romanies praise this herb very highly. It also has been a part of Chinese folk medicine for centuries. A decoction of the leaves of the herb coltsfoot to a pint of boiling water (strain before drinking) is very good for colds, coughs and asthma. If you haven`t time to make a decoction when a cough is bad, use an infusion of coltsfoot and take in teacupful dose. It can be sweetened to taste with honey. As a mild diuretic it has been used in cystitis. An infusion or juice from fresh leaves can be used as an antiseptic wash for wounds and skin blemishes. The fresh bruised leaves can be applied to boils, abscesses and suppurating ulcers as a poultice, (enclosed in fine muslin to prevent skin irritation)..
Coltsfoot is a low-growing perennial with fleshy, woolly leaves. A member of the daisy family, coltsfoot produces a single golden-yellow flower head that blooms in spring. As the stem dies, the leaves appear. It has long-stalked, hoof-shaped leaves, about 4 inches across, with angular teeth on the margins. The top of the leaf surface is smooth and almost waxy in appearance, while the underside is covered with white, wool-like hairs. Both surfaces of the leaves are covered, when young, with loose, white, felted woolly hairs, but those on the upper surface fall off as the leaf expands. The bright yellow flowers appear early in the spring, prior to the emergence of any leaves. In Southern Ontario, coltsfoot flowers in April, often before the last of the snow melts. Flower heads have even been known to push through snow. Some people confuse these flowers with dandelion flowers. The specific name of the plant is derived from Farfarus, an ancient name of the White Poplar, the leaves of which present some resemblance in form and color to those of this plant. There is a closer resemblance, however, to the leaves of the Butterbur, which must not be collected in error; they may be distinguished by their more rounded outline, larger size and less sinuate margin. The root is spreading, small and white, and has also been used medicinally. The underground stems preserve their vitality for a long period when buried deeply, so that in places where the plant has not been observed before, it will often spring up in profusion after the ground has been disturbed. In gardens and pastures it is a troublesome weed, very difficult to get rid of. 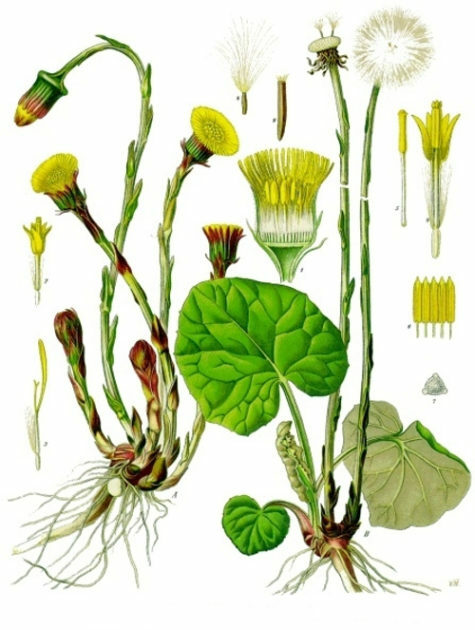 Pliny and many of the older botanists thought that the Coltsfoot was without leaves, an error that is scarcely excusable, for, notwithstanding the fact that the flowers appear in a general way before the leaves, small leaves often begin to make their appearance before the flowering season is over. Coltsfoot, for all its beauty, tends to like rough places to hang out. Seek it in waste ground, building sites, roadsides, the edge of woods, remembering that it has a preference for heavy clay. Coltsfoot grows abundantly throughout England, especially along the sides of railway banks and in waste places, on poor stiff soils, growing as well in wet ground as in dry situations. The plant is native to Europe, but also grows widely throughout the United States and Canada. 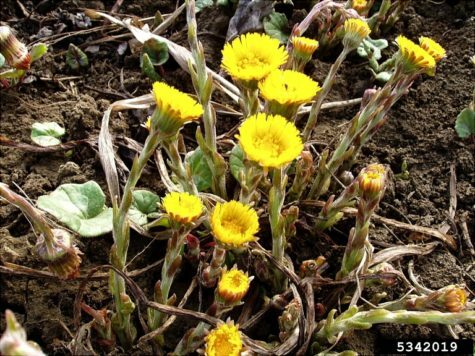 Coltsfoot is found in open, disturbed areas. It often grows in ditches, along roadsides, on forest edges and on steep slopes prone to landslides. It tolerates wet, poorly drained areas and riverbanks susceptible to spring flooding. Coltsfoot is collected widely from wild plants in the Balkans, Eastern Europe (Bulgaria, Czechoslovakia, Hungary, Poland, the former Yugoslavia), and Italy. After the leaves have died down, the shoot rests and produces in the following February a flowering stem, consisting of a single peduncle with numerous reddish bracts and whitish hairs and a terminal, composite yellow flower, whilst other shoots develop leaves, which appear only much later, after the flower stems in their turn have died down. These two parts of the plant, both of which are used medicinally, are, therefore, collected separately and usually sold separately. The flowers should be gathered before they have fully bloomed (end of late winter to mid-spring) and dried carefully in the shade. The leaves are best collected between late spring and early summer. They should be chopped up before they are dried and stored. The fresh leaves can be used until Fall. There are several varieties of Peppermint. The two chief, the so-called ‘Black’ and ‘White’ mints are the ones extensively cultivated. 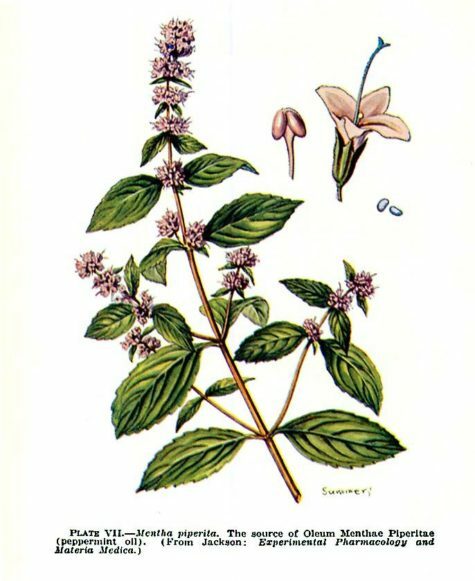 Botanically there is little difference between them, but the stems and leaves of the ‘Black’ mint are tinged purplish-brown, while the stems of the ‘White’ variety are green, and the leaves are more coarsely serrated in the White. The oil furnished by the Black is of inferior quality, but more abundant than that obtained from the White, the yield of oil from which is generally only about four-fifths of that from an equal area of the Black, but it has a more delicate odor and obtains a higher price. The plant is also more delicate, being easily destroyed by frost or drought; it is principally grown for drying in bundles – technically termed ‘bunching,’ and is the kind chiefly dried for herbalists, the Black variety being more generally grown for the oil on account of its greater productivity and hardiness. White Peppermint is a very important and commonly used remedy, being employed by allopathic doctors as well as herbalists. It is also widely used as a domestic remedy. A tea made from the leaves has traditionally been used in the treatment of fevers, headaches, digestive disorders (especially flatulence) and various minor ailments. An infusion is used in the treatment of irritable bowel syndrome, digestive problems, spastic colon etc. Externally a lotion is applied to the skin to relieve pain and reduce sensitivity. The essential oil in the leaves is antiseptic and strongly antibacterial, though it is toxic in large doses. When diluted it can be used as an inhalant and chest rub for respiratory infections. The essential oil is used in aromatherapy. Its keyword is “Cooling”. Peppermint is one of the best carminative agents available. It has a relaxing effect on the visceral muscles, anti-flatulent properties and stimulates bile and digestive juice secretion, and so can relieve intestinal colic, flatulent dyspepsia and other associated conditions. The volatile oil acts as a mild anesthetic to the stomach wall, which helps to relieve the vomiting of pregnancy and travel sickness. Peppermint plays a role in the treatment of ulcerative colitis and Crohn’s disease. It is most valuable in the treatment of fevers and especially colds and flu. As an inhalant it can be used as a temporary treatment for nasal catarrh. Where migraine headaches are associated with the digestion, this herb may be used. As a nervine it eases anxiety and tension. In painful periods it relieves the pain and eases tension. Externally it relieves itching and inflammation. How does it work? Peppermint oil seems to reduce spasms in the digestive tract. When applied to the skin, it can cause surface warmth, which relieves pain beneath the skin. Parts Used: The whole plant – Leaves, root, flowers. 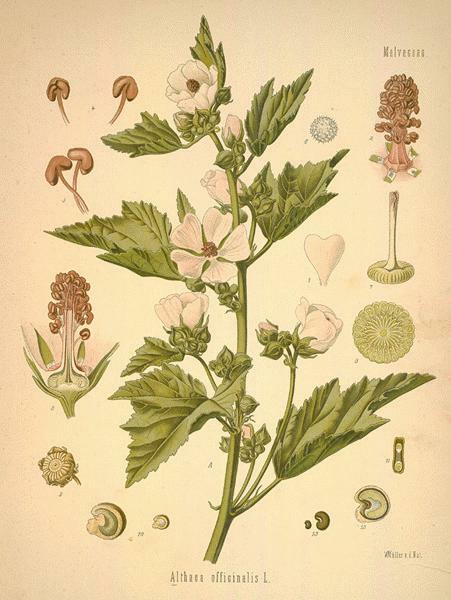 All mallows, including the garden hollyhock, contain quantities of mucilage and the marsh mallow is an especially soothing, healing herb, useful in treating bronchitis, internal inflammation and irritation, for stimulating the kidneys and as a gentle laxative. Tea made from the leaves makes a soothing eye bath. The high mucilage content of Marsh Mallow makes it an excellent demulcent (relieves inflammation). The root is used primarily for digestive problems, inflammations of the digestive tract and on the skin. The leaf is used for the lungs and the urinary system. For bronchitis, respiratory catarrh and irritating coughs consider Marsh Mallow leaf. It is very soothing in urethritis and urinary gravel. Externally, the root is indicated in varicose veins and ulcers as well as abscesses and boils. Parts Used: The whole plant – stems, leaves, flowers, collected in the wild state, in August, when in flower. 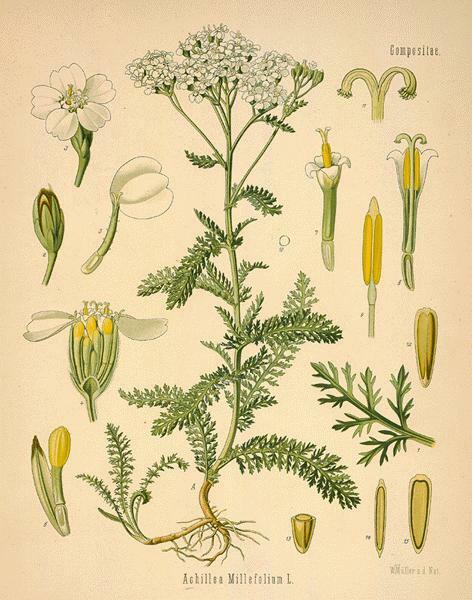 Yarrow is a wound herb, astringent and healing, and rich in vitamins and minerals. Bind bruised fresh leaves to cuts, or make an ointment by pounding the flowers and mixing with coconut oil, or bathe wounds with yarrow tea. The tea is also a good tonic drink, it restores lost appetite and promotes perspiration during colds and fevers. Chew fresh leaves to soothe toothache. Yarrow also lowers blood pressure due to a dilation of the peripheral vessels. It stimulates the digestion and tones the blood vessels. As a urinary antiseptic it is indicated in infections such as cystitis. It is considered to be a specific in thrombotic conditions associated with high blood pressure.